Wonderful news! The 2018 Amery Fall Festival event poster has officially been unveiled today! 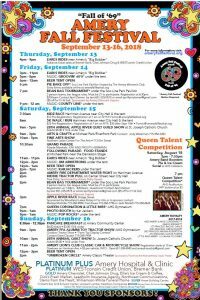 Refer to the Posters menu on our website, www.ameryfallfestival.org, to download the poster or simply click the poster above to view it today! There are many live bands, family activities, etc planned for this year’s festival – we can’t wait to see you there!